My husband is fond of maps, he likes collecting all sorts of NY maps and puts up in the wall or wherever possible. I did not like the way our living room was with maps all around , couple of them in doors, one pasted in wall like so. 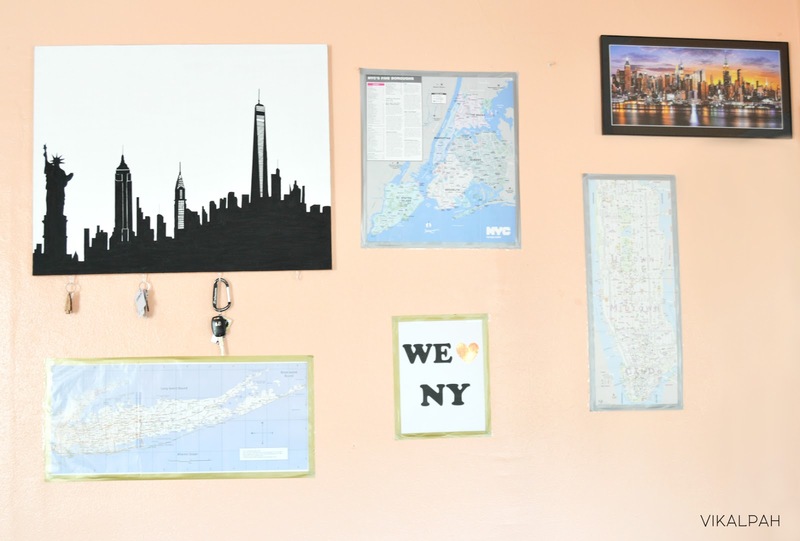 To overcome this , I decided to make New York gallery wall so that I can bring all the maps in one place and add pictures of New York here and there. We are so used to hang our keys in the DIY Multipurpose Wall art that I made last year,so I repurposed that into a New York Skyline Silhouette to add to the gallery wall and today I am sharing with you all how I made that. 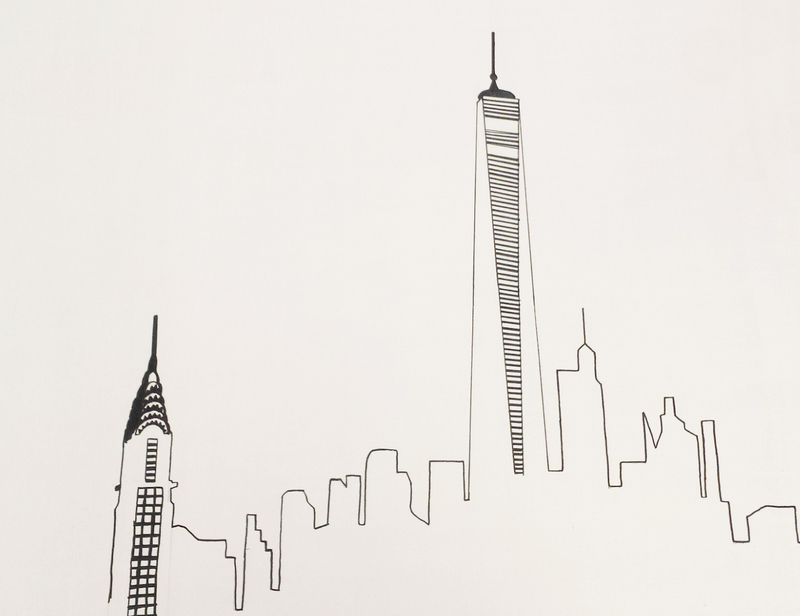 A canvas 22" X 28"
Step 1: First choose the important buildings which contributes to the skyline and decide the layout and height of the building by drawing a straight line. 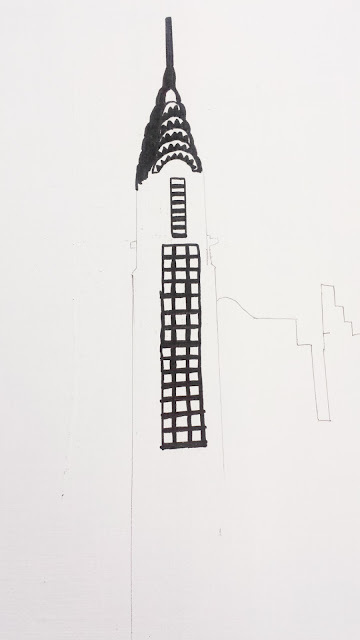 I took an image from google as an reference image ,however this particular image is not exactly how the New York skyline looks which I came to know only after I completed the painting. 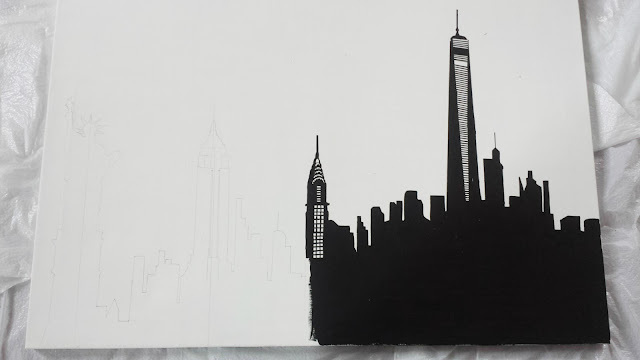 I was so keen to finish the silhouette that I did not think much about the layout. But that is okay as long as the buildings represent New York. 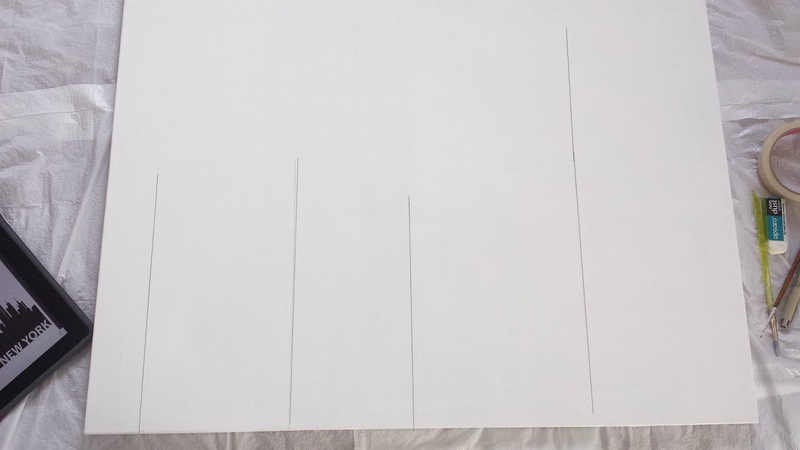 But if you are so keen about the layout , check the image twice to make sure that the image looks how you wanted it to look like because if it is not ,you can make the changes when you start the painting. 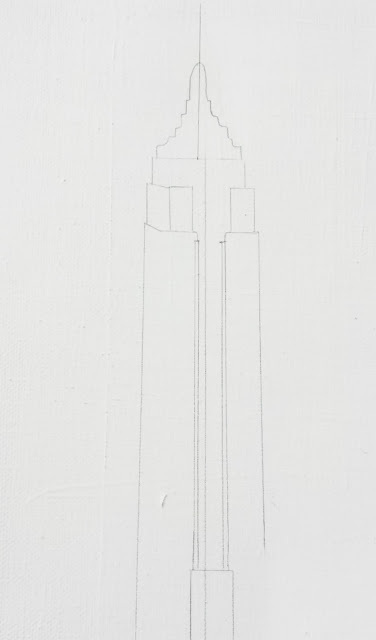 Step 2: I decided to split the canvas into two and completed one part and then shifted to the next.First draw the outline of the building around the straight line and then add dimensions to the building using pencil.Once you are satisfied with the look add architectural details like windows,arches,etc. 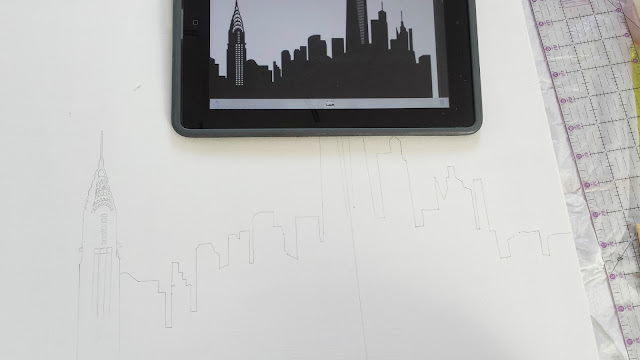 Step 3: Now use the fine point paint pen to draw the outline and details of the buildings. 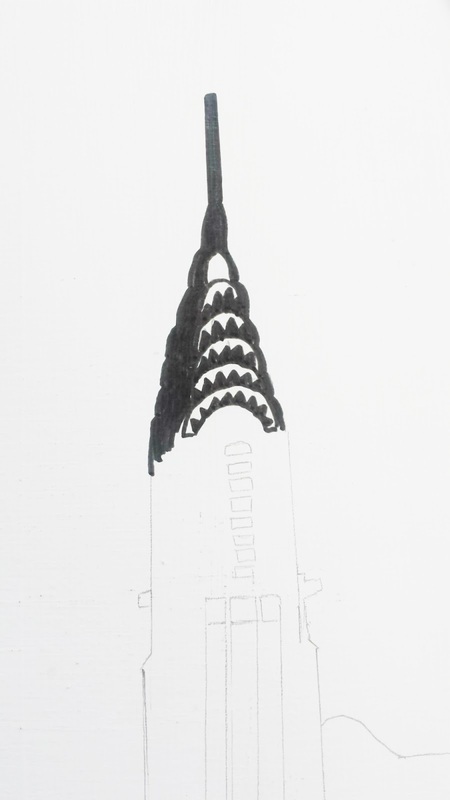 Step 4: Fill in the area with black acrylic paint ,be patient and careful while painting the corners. Use Painters tape and paint brush with small tip if needed. 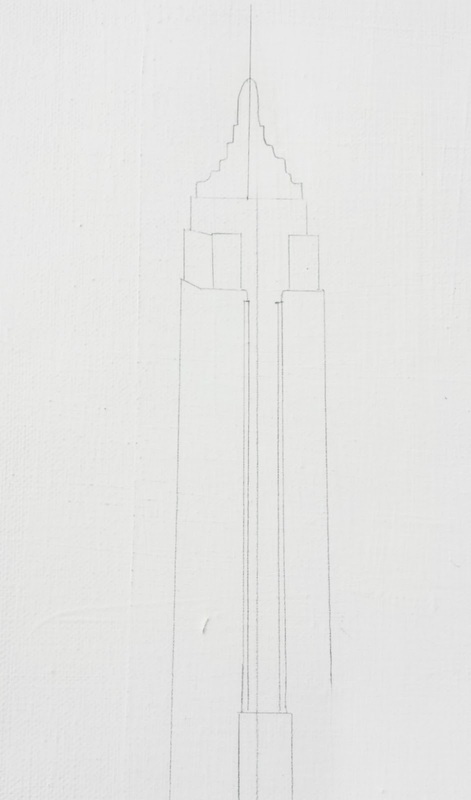 I used a strip of painter's tape to paint the edges of the World Trade Center. Your painting is now half done. 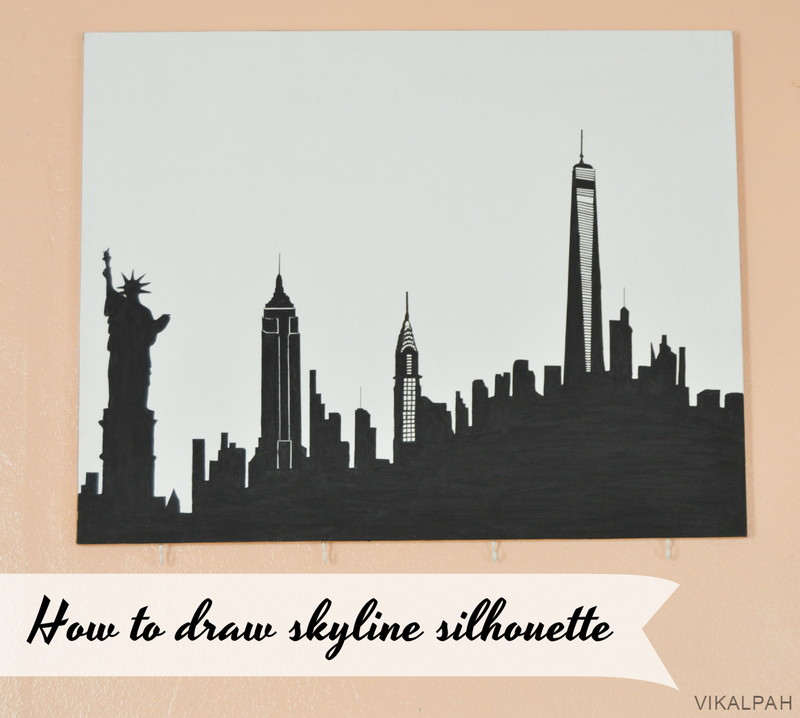 Step 5: Repeat the same steps to complete the remaining half of the painting.Then, Your skyline silhouette is ready to beautify your wall. I painted the sides of the canvas with gold paint as you may know how much I love gold accent but it is your choice to paint the sides or leave it as is. I also removed the hooks from one sides and screwed them all to the other side to hang keys.But these are optional steps. I used clear tape, permanent double sided tape and metallic washi tape to paste the maps on the wall. (Ya that sounds like too many tapes;) But if you don't want touse many tape you can use sticky back velcro to hang them. I used tapes as I had them in my stash). 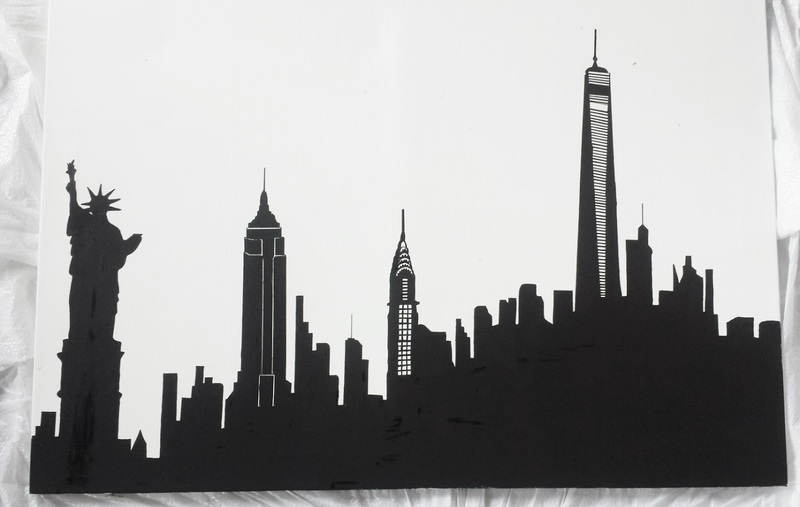 Surprisingly, when my cousin and family visited us ,they got us a beautiful picture of NY skyline at night.They knew me well,right? 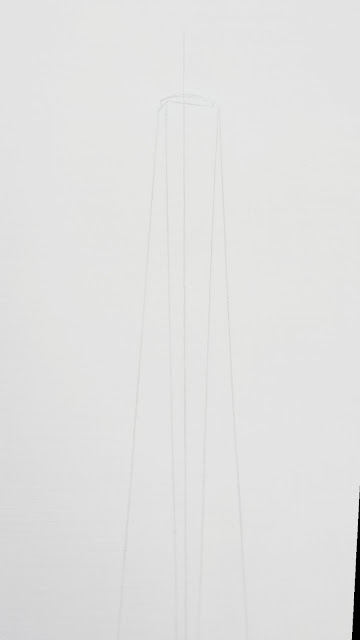 (They have no idea that I am making a NY gallery wall. I made these before they actually came to visit us.It was a total coincidence.) 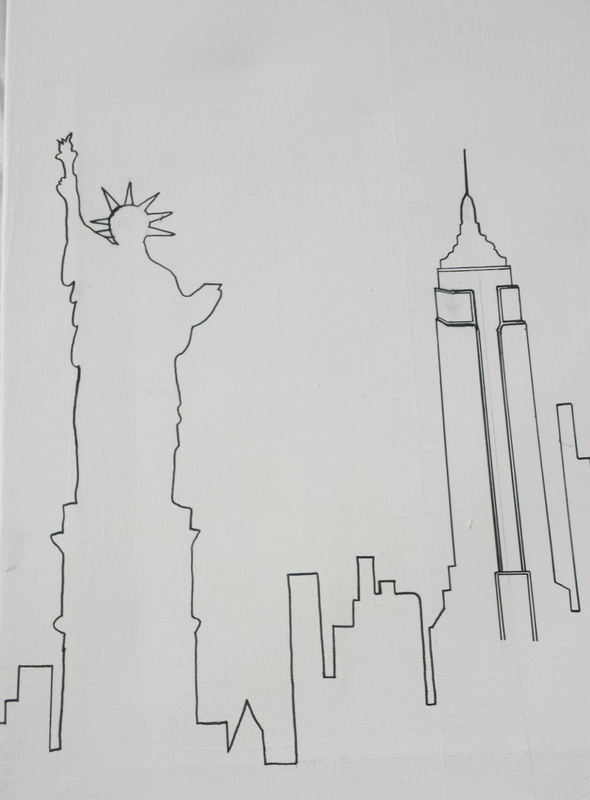 It was very much perfect for the NY wall so I mounted that above the one of the maps. The arrangement of the pictures are not in a perfect layout as I tried to use the nails that are already there on the wall. Even though not 100% perfect, I like how it turned out. May be I will do little modifications and add some extra touches(Like a photo of us in NYC ,some quotes,etc) when I get a chance. 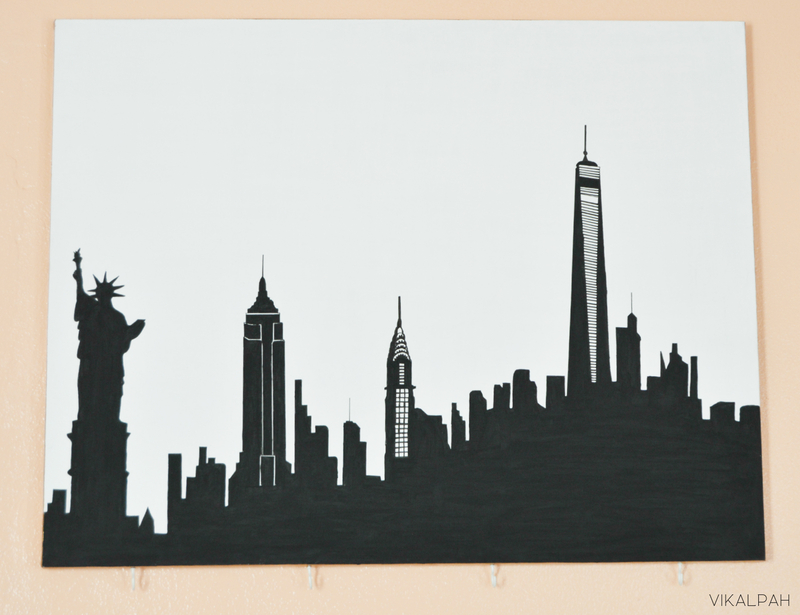 What do you think about that skyline silhouette and gallery wall? Share with me in the comments below. As always I will be happy to hear from you. 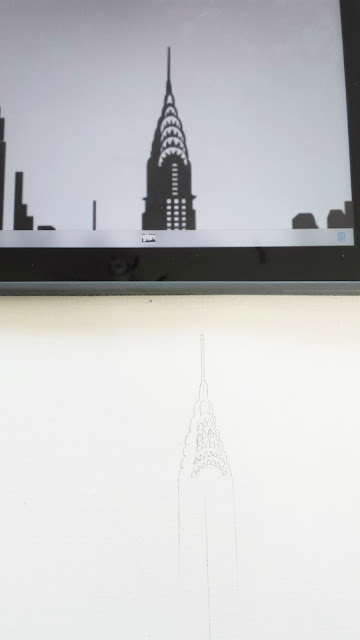 This is such a cool tutorial on drawing - it takes a great deal of attention to detail! Thank you for linking up at #BloggersBrags I will be pinning this one!